The second annual Marin-Sonoma Concours d’Elegance is planned for May 16 and one of this year’s special categories will be vintage wooden boats. The boats will be displayed on the lagoon that is part of the sprawling Marin County Civic Center Fairgrounds where the show will be held for the second year in a row. But back to the cars. The organizers expect to showcase 200 exotic and rare vehicles in 18 different classes with Porsche as the featured marquee. 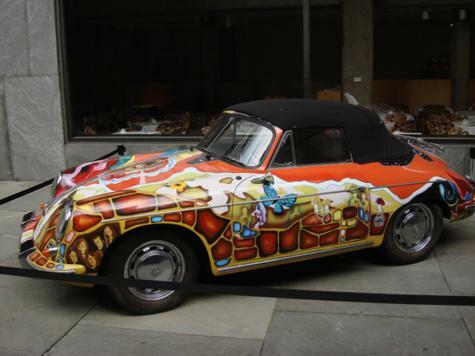 One very special Porsche will be on display; rock singer Janis Joplin‘s 356 Porsche convertible pictured above. The car, with it’s psychedelic paint-job, is on loan from the Rock and Roll Hall of Fame Museum in Ohio. A special exhibit of Hot Rods and the amazing Lexus LFA Supercar (the only one in the U.S.) round out the show. A special pre-show drive takes place the day before in West Marin; 150 classic and vintage cars will take to the road to celebrate the joy of the drive. In addition to the cars will be vendors with automotive products, food and live music. The Concours proceeds will benefit Hospice By The Bay. Sunday, May 16, 2010 from 9:00 a.m. to 4:00 p.m. Thank you for posting such a beautiful blog i like this blog and i want to subscribe it so can you please tell me when you updated. Thank you "Hospice California"…You can subscribe to this blog…look for the "Subscribe to" on the right hand side of the blog and you can be a follower as well. enjoy!